PR - Available and accessible safe spaces can advance the cognitive, emotional and social skills of young people. This year’s theme will reflect on the significance of safe spaces in providing opportunities for sport, innovation empowerment and leisure time activities, while deconstructing barriers of judgment, hate speech, harassment or violence. Youth need safe spaces where they can come together, engage in activities related to their diverse needs and interests, participate in decision making processes and freely express themselves (UN, 2018). While there are many types of spaces, the dignity and safety of youth in the education and academic space is threatened by the rise of violent conflicts between schools and gender-based violence and bullying in schools. Apart from written laws and regulations, how are we creating and fostering safe spaces in the education arena? Whose role is it? 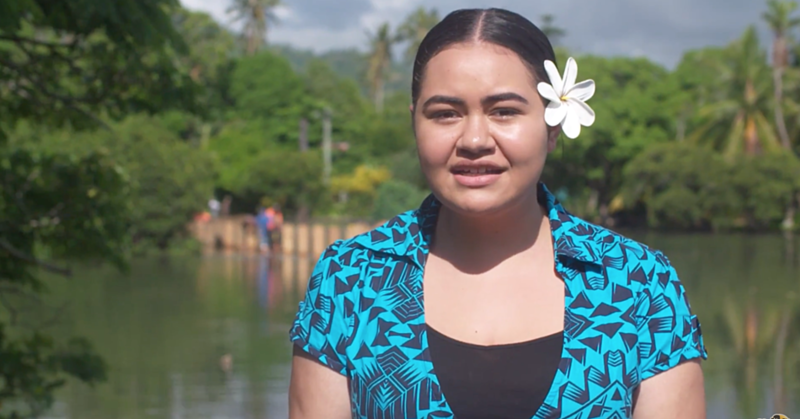 Tahere Siisiialafia, in her capacity as Chair for the Pacific Youth Council, she initiates youth-related activities for students apart from the usual in-classroom learning routines, through her profession as a young lecturer at N.U.S. Hence the Peer-2-Peer Initiative was created in 2017 as a solution-based and asset-based initiative grounded on a positive youth development model in accelerating academic learning and embed students with life-long learning. Since its development it has become a safe space for peer to peer mentoring and learning, and a space that fosters positive relationships among students. Therefore, the Innovation Lab created an opportunity for student leaders of selected secondary schools and students of the National University of Samoa, who have a unique insight into the challenges that affect the security of education, to consider ways in which they as students and student leaders can develop creative solutions to foster safe spaces that promote inclusion, dignity and safety of young people and schools. We had student representatives from Vaimauga, Leififi and Papauta Girls College engage with NUS students in this innovation lab. The icing on the cake for this event was having the presence of our Honorable Prime Minister and our Miss Samoa, Alexandra Iakopo. The first session was a CHIT-CHAT with the Prime Minister who spent two hours of dialogue with participants. 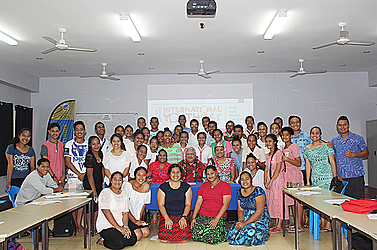 It was only scheduled for 30 minutes but the fact that Tuilaepa Dr. Sa’ilele Malielegaoi spent two hours sharing lessons learnt from his experiences from childhood and reign as Prime Minister with our participants, manifested his joy to converse with our young people and reflected his hopes for our young people. This was relayed to encourage students not to feel intimidated by those who speak better English and that we do not become ignorant of the significant essence within our own mother tongue. As he told tales of his childhood and enlightened students with his Memoir, it laid out a clear picture of how different the circumstances of safe spaces experienced by past generations and that of today’s generation. Safe spaces in this present age are more threatened than ever before given numerous social changes in our societies; however, it is the role of young people to take it upon themselves to be aware and well-informed, be proactive, and take responsibility in creating and ensuring safe spaces. Nonetheless, our Miss Samoa Alexandra Iakopo highlighted in her keynote address, “…it is the way you present, respond and react towards one’s opinion, actions or situation, that determines whether you as a leader or as an individual, is creating a safe or unsafe space for our people and future generations.” As students were engaged in the innovation lab coordinated by Miss Tahere Siisiialafia, Miss Iakopo facilitated the teacher’s group and engaged them in discussions of how teachers can create an enabling environment that supports students and student leaders in creating and fostering safe spaces in schools. The innovation lab concluded with students developing solution-based action plans of anti-bullying and zero-tolerance of gender-based violence. The hope is for student’s/ student leaders to return with an aspiration to develop and translate the solutions they developed in this lab into social action within their respected schools provided the support of teachers.